At Mitsubishi Heavy Industries' Kobe plant in western Japan, one of the world's largest milling machines is turning out sub-segments for ITER's toroidal field coil cases. These mighty steel components will constitute the main structural element of the magnet system—not only encasing 2,000 tonnes of superconducting toroidal field winding packs, but also anchoring the poloidal field coils, central solenoid and correction coils. ITER Director-General Bernard Bigot visits the Mitsubishi facility in Kobe in October 2016, accompanied by officials from the Japanese Ministry of Education, Culture, Sports, Science and Technology (MEXT) and the Japanese Domestic Agency. Pictured, a 71-tonne inboard leg (''AU'') sub-assembly before final machining. Eighteen D-shaped toroidal field coils, spaced uniformly around the torus, will produce the magnetic field that confines the ITER plasma particles. During ITER operation these coils—each made up of a superconducting winding pack and surrounding stainless steel coil case—will be subjected to tremendous electromagnetic loads, on the order of several hundred meganewtons (or tens of thousands of tonnes of force) per coil. The massive case superstructure of the toroidal field winding packs is designed to resist these loads. Representing nearly one-third of the total weight of the magnet system, the encasing structures are strongly linked between themselves to support in-plane and out-of-plane forces. On their inboard sides, closest to the central solenoid tower, the coil cases are bound together by pre-compression rings at top and bottom. On the opposite side, intercoil structures on their outboard surfaces will link them above and below mid-plane. The poloidal field coils, correction coils and the central solenoid are all attached to the toroidal field coil cases through supports that are rigid in the vertical and toroidal directions yet flexible in the radial direction. The ITER poloidal field coils, central solenoid and correction coils will be anchored against the 3,400-tonne toroidal field coil case superstructure. In the insert, the different elements of the D-shaped toroidal field coil assembly are shown: the inner winding pack (in green), and the inner (BP, AP) and outer (BU, AU) coil case sub-assemblies. This tight integration of the different magnet systems contributes to containing and balancing the strong electromagnetic forces at play in the machine. "The toroidal field coil structures—among the largest and heaviest components of the magnet system—support the poloidal field coils and the correction coils. Their alignment, in order to ensure the assembly of the torus and minimize magnetic field errors, calls for very tight tolerances and precise machining, both of which present significant challenges," says Arnaud Devred, deputy Magnet Division head. 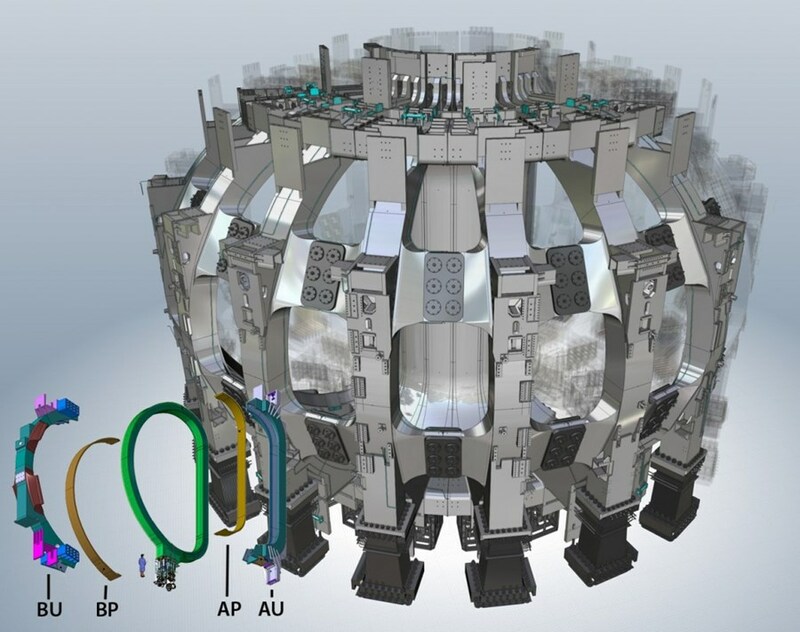 "The ITER Organization and the Japanese Domestic Agency have been working very closely together to optimize manufacturability; this collaboration now includes the European Domestic Agency which is the recipient of half of the toroidal field coil structures produced in Japan. The coil cases are another example where teamwork and close interaction at the working level is required to overcome both technical and schedule issues." Japan is manufacturing 18 full case assemblies for the ITER toroidal field coils, plus a nineteenth as a spare. Each coil case is assembled from seven sub-segments that are formed into an inboard leg (seen as "AU" in the above image) and an outboard leg ("BU"). There are also inboard ("AP") and outboard ("BP") inner plates that will be installed after the insertion of the winding pack. In all, approximately 190 tonnes of high strength 316LN stainless steel is needed per coil case, bringing the weight of the coil case superstructure to 3,400 tonnes. Following extensive manufacturing studies and full-scale trial fabrication, the manufacturing of this key structural element is underway now in Japan. 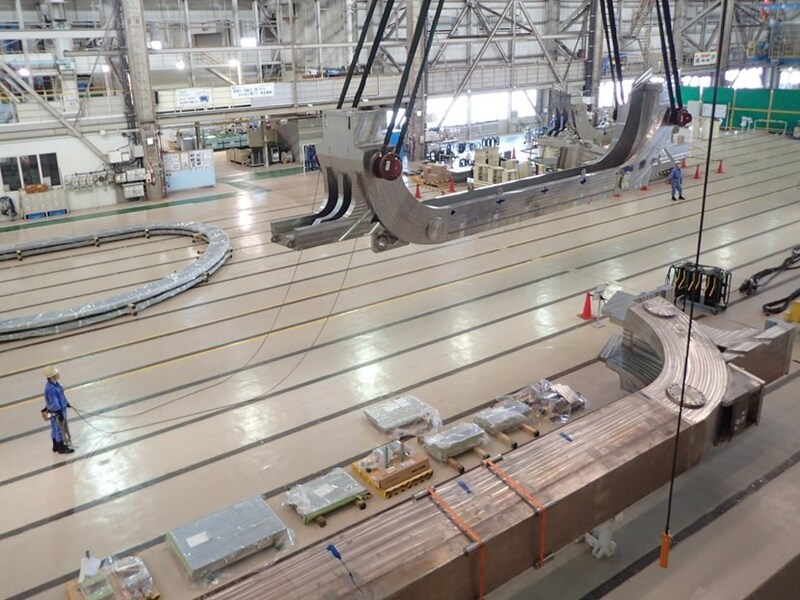 Inboard sub-segments are now manufactured in series at Mitsubishi Heavy Industries' Kobe plant; three sub-segments form the AU sub-assemblies that can be seen on the shop floor. In 2017 the first completed coil case will be shipped to Italy for the insertion of a European toroidal field winding pack. The most critical technical issue during manufacturing is the tightness of tolerances—just a few millimetres for components that, once assembled, measure 16 metres in height and 9 metres in width. Specialized welding techniques have been optimized to control distortion during the welding of steel plates that range from 6 to 40 cm in thickness. The closure welding process—which will intervene after the winding packs have been inserted—is in the planning stages, with a mockup test and computer simulation underway to estimate and correct welding deformation. Tolerances of a few millimetres are required on the coil cases for proper assembly in the tokamak. 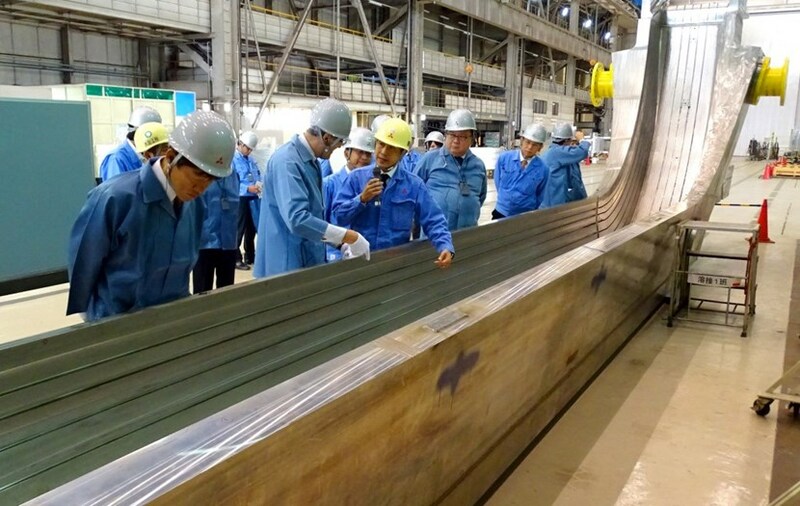 At Mitsubishi Heavy Industries in Kobe, coil case segments are now produced in series and the first inboard (AU) sub-assemblies have been assembled and welded. Manufacturing is on schedule for the shipment in 2017 of the first completed case to Europe, where contractors will carry out the insertion of the first European winding pack and closure welding. Of 19 coil cases produced by Japanese contractors in the coming years, 10 will be shipped to Europe (the nine others will accommodate toroidal field winding packs produced in Japan). 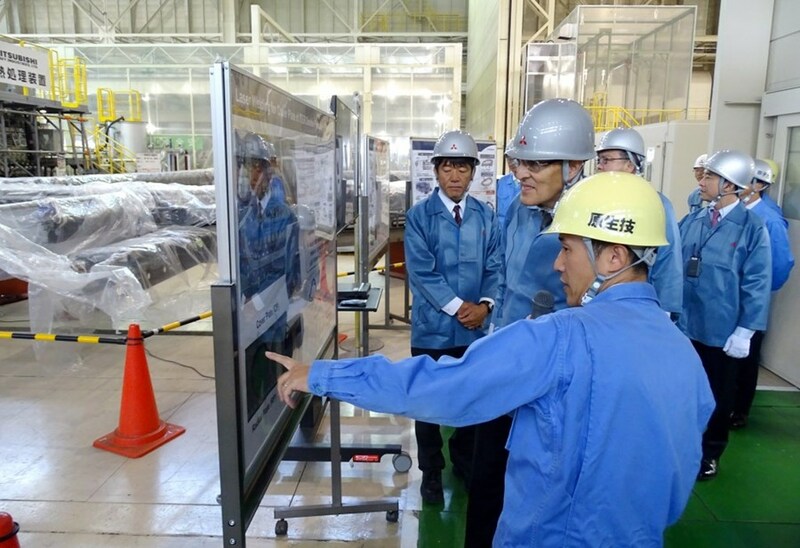 The first completed toroidal field coil will reach the ITER site in 2018, shipped by the Japanese Domestic Agency. Japan is manufacturing 18 full case assemblies for the ITER toroidal field coils, plus a nineteenth case as a spare. The most critical technical issue during manufacturing is the tightness of tolerances, requiring precise machining and specialized welding techniques.